I live and work in North Norfolk where the skies are wide and the weather can be wild. I blog about working as a contemporary artist, upcoming exhibitions and work, and other artists and pieces I find interesting. 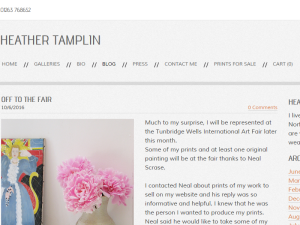 This what your Heather Tamplin, Norfolk Artist Blog Ad will look like to visitors! Of course you will want to use keywords and ad targeting to get the most out of your ad campaign! So purchase an ad space today before there all gone! Night Garden was selected for Connections at Wells Maltings this year. It is the first exhibition at the new Wells Maltings, a wonderful centre for the community of Wells. In the distance you can just see Blickling Lake, with a small section of Blickling Hall, windows alight behind the trees. The llama and the head of the dog are from drawings done at the Sainsbury Centre. The girl holds a tin milagro a religious folk charm traditionally used for healing purposes and as a votive offering. I was also involved in the Heritage Art Trail, working with Robert Smith the Harbour Master, setting the text and getting it fabricated for the old Mortuary Doors. It is a moving piece, those doors have been passed through by so many people, each leaving some of their atoms caught in the wood grain. You can find this piece on the wall of the Harbour Master's Office down on the Quay. Almost opposite Rachel Long's wonderful Lifeboat Horse out in the harbour. The Heritage Sculpture Trail is well worth taking the tie to walk round, some really good pieces of work around the town and down on the quays and it runs until the end of September. Also many good places to eat in Wells! Feel so pleased that this painting has been selected for the "Inheritance" exhibition at Norwich Castle Museum next Spring. The painting has been on and off the easel over the last three or four years. It was also pre-selected for the Threadneedle Open at the Mall Galleries in London this year, but didn't get through 2nd selection to get hung on the walls. Being the artist I am on the rocking horse and the biggest of course, really Sue is the eldest, then Frank, me then Ruth with Deb last. The location is down the yard at the end of a sloping drive by the side of our childhood home a 3 storey Victorian house in Caterham Surrey. Just beyond the wire fence of the yard was the rail track, with a wooden signal box opposite. We weren't supposed to play in the yard - but we did when we could get away with it. A small pear tree had stomach achingly hard pears, in the painting the budgies mum bred from 2 that Frank brought home one day - Bebe & Bobo are perched in its branches. Colin Millington makes amazing pictures about the sea using wool. They are like the naive paintings sailors make of their lives and ships, but softer and more seductive. Colin lives in North Norfolk and his work has been on show at Paffron & Scott, in Melton Constable North Norfolk, and featured in one of the glossy interior and lifestyle magazines. Luke has been a long time admirer of Colin's work. 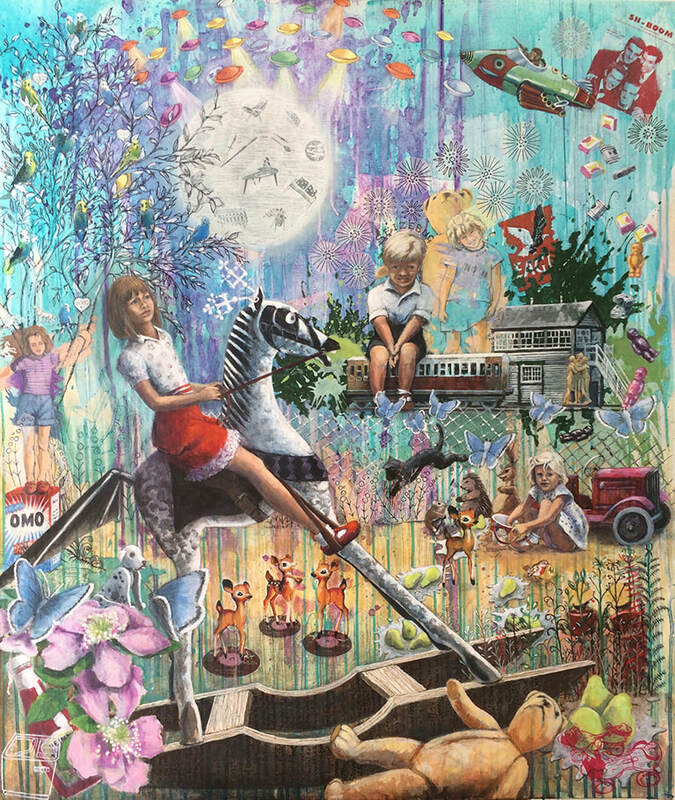 The show finishes this weekend so be sharp if you want to enjoy the visual delight of Colin Millington. Luke has a wonderful mix of antiques, furniture and lighting for sale so well worth a visit anyway. This is the 4th Fleet Foxes track I have developed as a collage, the lyrics are dreamily surreal. The whole CD carries echoes of times past, I love this particular track, "Tiger Mountain Peasant Song" but the whole CD is is good. I have put a link to it below so you can have a listen. Norfolk skies have been wonderful this Summer, lots of fabulous billowing clouds blown by coastal winds; the colour palette of the North Norfolk landscape is incredibly harmonious and beautiful. Margie Britz captures the essence of this slice of Norfolk in her work. I saw her show at Salthouse church this month and her work, like the landscape and geology that inspires her , is harmonious, beautiful and all the right colours. Most of the paintings were square canvases 122cms with titles that indicate the materials in their construction; Dust to Dust, Desert, Push Moraine. Margie uses earth pigments collected on site and uses these with gouache to make her paintings. You could live with any of her paintings. Much to my surprise, I will be represented at the Tunbridge Wells International Art Fair later this month. Some of my prints and at least one original painting will be at the fair thanks to Neal Scrase. I contacted Neal about prints of my work to sell on my website and his reply was so informative and helpful. I knew that he was the person I wanted to produce my prints. Neal said he would like to take some of my prints to the fair plus one original, and if there is space, he will take more, so I am more than a little delighted. One of the best exhibitions I have seen this year is Nigel Skinner's work at Salthouse church. Found and collected material, dust, parts of birds skeletal remains, metal and wood that time has textured and aged are incorporated into his work and these powerful objects with their own history add another layer to the of strong emotional response his work provokes. The exhibition has finished though you can see Nigel's work on his web site Link below and by visiting him in his studio in the deep heart of Norfolk. This one was a bit of a struggle because I didn't want to make it too literal. I'll most likely start work on Oliver James next or Tiger Mountain Peasant Song., it is so hard to decide between these two. 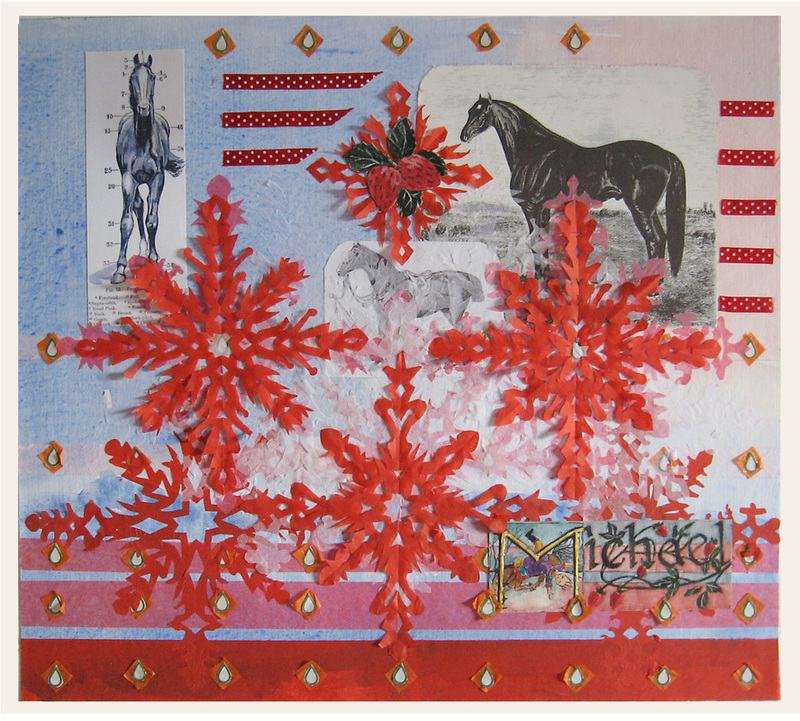 I like collage, it's restrictions are interesting and can send you down unexpected paths to create a piece of work. 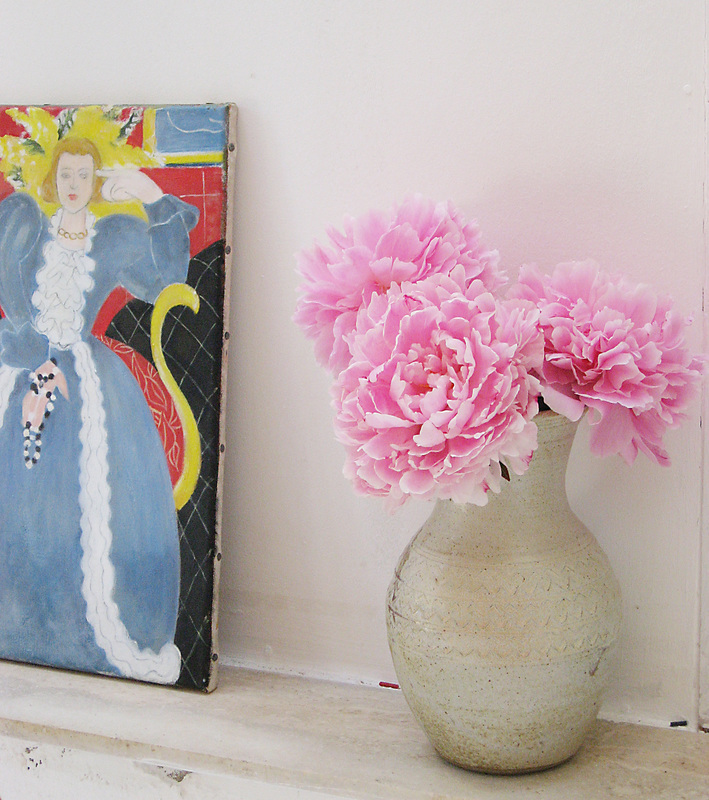 If you are the owner of Heather Tamplin, Norfolk Artist, or someone who enjoys this blog why not upgrade it to a Featured Listing or Permanent Listing?